In a 2 player game, deal 10 cards to each player. In a 3 player game, deal 9 cards to each player. In a 4 player game, deal 8 cards to each player. In a 5 player game, deal 7 cards to each player. Place the rest of the cards in a face-down pile in the center of the playing area. Grab a pice of paper and pencil to keep score and designate one player as the scorekeeper. The game takes place over 3 rounds. To start a round, all players simultaneously choose any 1 card from their hands that they would like to keep and place it face-down in front of them. When each player has done this, everyone reveals their chosen cards. After revealing cards, pass your remaining hand face-down to the player on your left. Everyone picks up their new hands and the next turn begins. You now have a new and smaller hand to choose from. Note: Face-up cards remain with you until the end of the round, when they are scored. It is helpful to group cards of the same type together. If you choose a squid, salmon or egg nigiri card, and already have a wasabi card in front of you, then this nigiri must be placed on top of the wasabi. This is to show that the nigiri has been dipped in wasabi and has tripled in value! Note: You may have multiple wasabi cards in front of you but only 1 nigiri card may be placed on each wasabi card. If you already have a chopsticks card in front of you, you may take 2 sushi cards on a future turn! Here's how it works: Choose the first card you would like from your hand as usual. 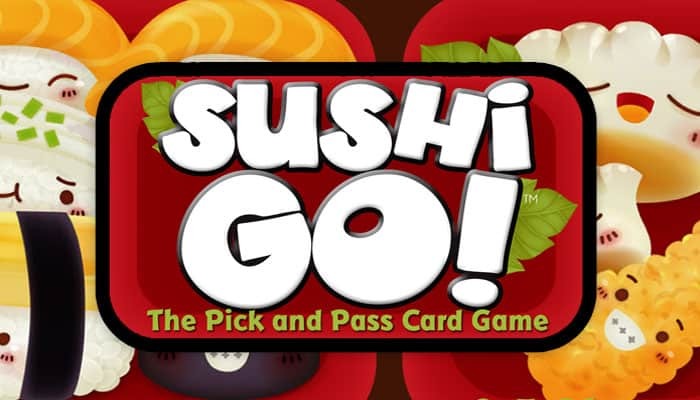 Before everyone else reveals their cards, call out "Sushi Go!" and take a second card from your hand, also placing it face-down on the table. Then all players reveal their cards. Before passing hands, put the chopsticks card back into your hand. This means it will now be passed on, and other players may take it to use again. Note: You may have multiple chopsticks cards in front of you but may only use 1 per turn. When the final remaining card of each hand is passed on, simply place it face-up with the other cards you have collected. (Often this final card won't be of much use, but sometimes an unfortunate player will be forced to leave you with something valuable). Each player adds up the maki roll icons at the top of all their maki roll cards. The player with the most icons scores 6 points. If multiple players tie for the most, they split the 6 points evenly (ignoring any remainder) and no second place points are awarded. The player with the second most icons scores 3 points. If multiple players tie for second place, they split the points evenly (ignoring any remainder). A set of 2 tempura cards scores 5 points. A single tempura card is worth nothing. You may score multiple sets of tempura in a round. 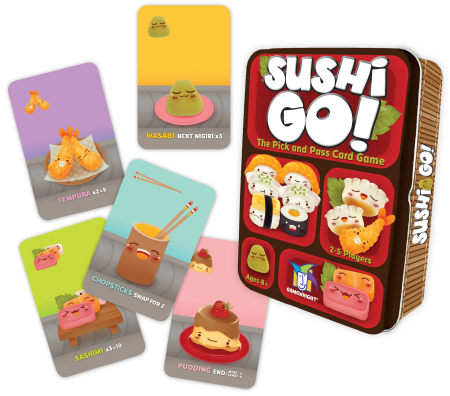 A set of 3 sashimi cards scores 10 points. A single sashimi card or a set of only 2 is worth nothing. You may score multiple sets of sashimi in a round, although this is very hard to do. A squid nigiri scores 3 points. If it is on top of a wasabi card it scores 9 points. A salmon nigiri scores 2 points. If it is on top of a wasabi card it scores 6 points. An egg nigiri scores 1 point. If it is on top of a wasabi card it scores 3 points. A wasabi card with no nigiri on it scores nothing. A chopsticks card scores nothing. Announce your scores from the previous round for the scorekeeper to record. Discard your cards face-up beside the draw pile. The only exceptions are pudding cards which you keep in front of you to be scored at the end of the game. Deal every player another hand of cards from the draw pile, equal to the amount from the last round. After the third round is scored, there will be some cards remaining in the draw pile. These are ignored. Now it's time for dessert! Pudding cards are now scored. The player with the most pudding cards scores 6 points. If multiple players tie for the most, they split the points evenly (ignoring any remainder). The player with the fewest pudding cards (including players with none) loses 6 points. If multiple players tie for the least, they split the lost points evenly (ignoring any remainder). Note: In a 2 player game, no one loses any points for puddings. Only the points for most pudding cards are awarded. Whoever has the most points after 3 rounds is the winner. In case of a tie, whoever has the most pudding cards wins!